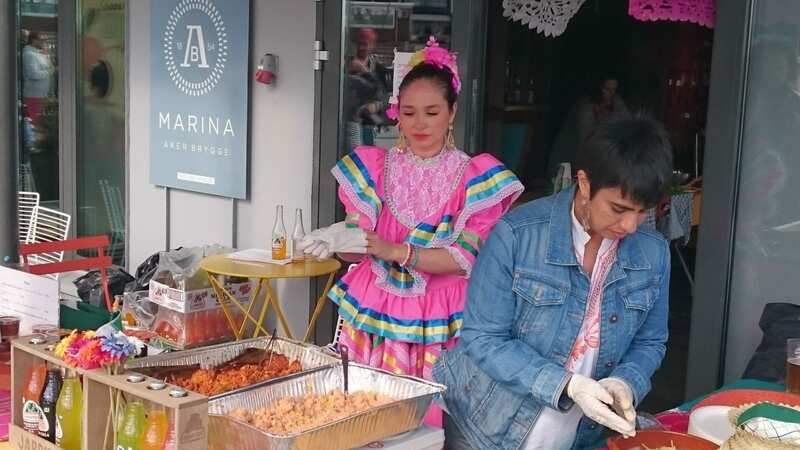 On 2nd and 3rd of July, you could discover a Mexican Taco Fiesta festival at Marina on Aker Brygge in Oslo. 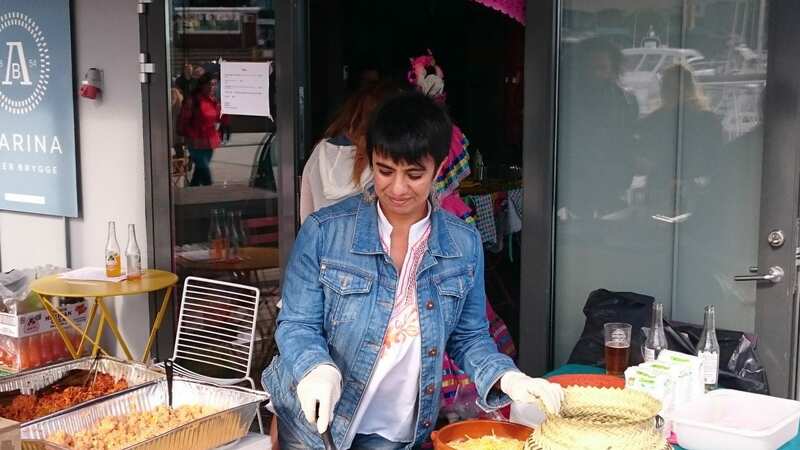 Here people could do everything in the Latino way: dance, eat delicious food and also get to know people from Mexico in Oslo, Norway. Distrita went there, because we have two writers from Tabasco in our staff and I felt it would be a nice touch to Distrita.com to show how South Americans in Norway celebrate the Tacos. The location is excellent: At the harbour side of Oslo’s most popular sea promenade. There are restaurants and cafes all the way along the promenade and the area is connected to the new and popular area Tjuvholmen. This entire area is the number one area to go on a sunny day! Especially in the weekends Aker Brygge is very crowdy, located by a good mix of local people and tourists. So, here is our pictures from the Event! One of the brilliant and talented Mexican dancers. With some very turbulent weather, but they had great performance and the food is amazing. However. Without Distrita team walking around to find something to write about, this festival would be too little known. 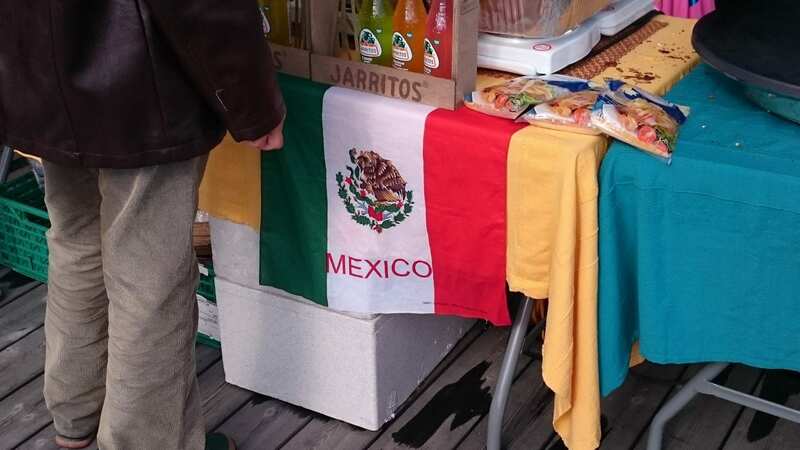 This Mexican Taco Fiesta festival should be much more promoted by Marina and Oslo town itself. It is really nice to see them dance and I got very happy, to see so many people standing around when they danced even when it rained to show respect and support the incredibly talented dancers. 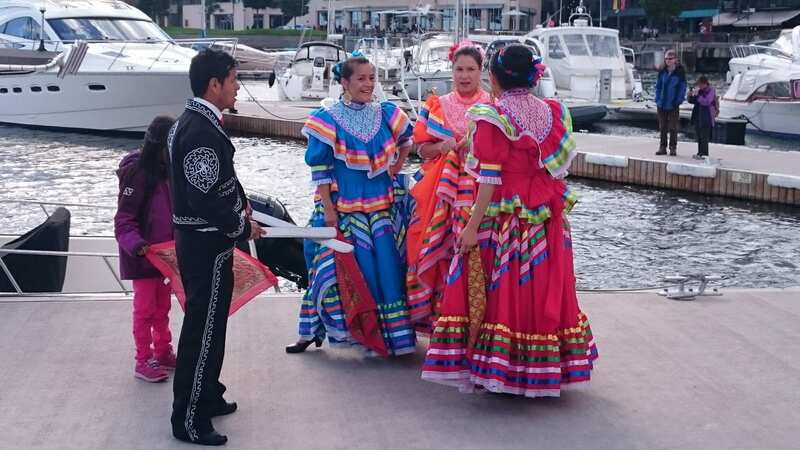 The dancers wear typical Mexican dresses in beautiful colors. Here you find typical drinks like Corona / Coronita (beer) and Jarrito (mineral water or soda). The Corona beer is world famous and popular everywhere, while the Jarrito is almost unknown outside of Mexico. Although it is a competitor to Coke or Fanta, you find dedicaded flavors and the it tastes sweet and yummy. If you love tacos, burritos, fajitas, tortilla, nachos with guacamole, you will definitely not be dissapointed here! So, although Oslo just had a small festival this time, we could enjoy the best of the latin-american kitchen and culture. In Mexico they have massive celebrations all year round, and they are really good at celebrating! We have earlier covered Mexico Tabasco Fair Festival. Happy reading!